Last article was “Building A Simple Product Management App Using Angular JS + Cygnite PHP Framework + Bootstrap - Part1”.. Tutorial part2 will be posted coming days. I have drafted this article couple of days back and finally got some time post here. You might have heard about the new major version of PHP is under active development since a year and finally scheduled to release this year. The PHP 7 timeline was approved by core members and aims to release PHP7 in OCT 2015. Even though little delay but we are lucky to see PHP7 end of this year. With the RFC for PHP7 timeline passed (32 to 2). We have now entered into new generation and PHPng is almost ready to speed you up. The features of PHP7 are fairly enough for advance web application development and making use of latest resources to boost you development. There are lot of talks about PHP5.7, PHP6 or PHP 7. The main reason behind the PHP7 is PHP6 has never reached to stable version, also there are many resources available about PHP6. So PHP community has chosen PHP5.6 to directly PHP7. Let us get into some details. You might have heard about Facebook HVVM out there, to provide you maximum performance for PHP based application. So PHPNG (PHP-Next-Gen) started with the idea to provide maximum performance as Facebook HVVM provides. The performance improvement source was led by ZEND to speed up PHP based applications. As per Zend performance improvement is huge! You can find some benchmark against HVVM here. Without changing single piece of code, just upgrading to PHP7 gives you enormous performance. Deprecating many redundant features also part of performance improvement of PHP7. While many developers would like able to declare return type for the function or method. By default PHP7 will allow developers to declare what kind of return type function is expected to return a value. It is almost similar as Type hinting parameters as below. Above example is similar as Facebook HACK syntax. In this example bool indicates the function will return only boolean value. You can also have look at many example in RFC here. This allows developers to set expecting strings, int, float or bool to be passed or returned. PHP7 will introduce a new operator called spaceship operator (<= >) otherwise called combined comparison operator. It can be used mostly in sorting and combined comparison. It works like strcmp() or version_compare(). As per the PHP RFC common uses of sorting as below. It is a beautiful addition to the PHP version. You can find more example here. Apart from above changes there are few new features added into the PHP7 core. I am listing few major changes below. • Abstract Syntax Tree: – Another big change on the core. But most likely to be visible to developers. It makes parsing php code easier, less error, and way to build better things in future. • Closure::call() : – This is the new method added into core. It allows variable binding at call time rather pre-binding. • Null Coalesce Operator : – The coalesce operator or ?? added to the core, which returns the first operand is exists or null. • Uniform Variable Syntax : – The main deference of existing syntax and new syntax is to keep consistence and complete variable syntax. Allows advance expressions. • Unicode Codepoint Escape Syntax: – PHP7 introduced syntax to escape unicode codepoint as below. Developers can stop recognizing method name as class name to be a constructor as per PHP4 . It has been controversial early to remove but later has been removed completely as currently we no longer required to warn PHP developer how PHP4 works. This removal added as simplicity. mysql_* functions are completely removed as extension removed by default. Multiple default clause support has been removed from the switch case. You can find more, list of deprecated or removed functionalities here, Removed deprecated functionalities in PHP7 . Personally I believe recent changes of PHP versions, makes PHP as much more matured language. But it is good message to all PHP developers for building awesome enterprise level applications using latest PHP version. What do you feel about PHP7 / New RFCs ? Do you think PHP development taking a turn towards better enterprise development? Let me know your thought by passing your valuable feedback or commenting below. Feel free to share or like us. Keep visiting. Have a nice day. In this tutorial I will show you how you can make use of Angular routing to build single page application without refreshing page. 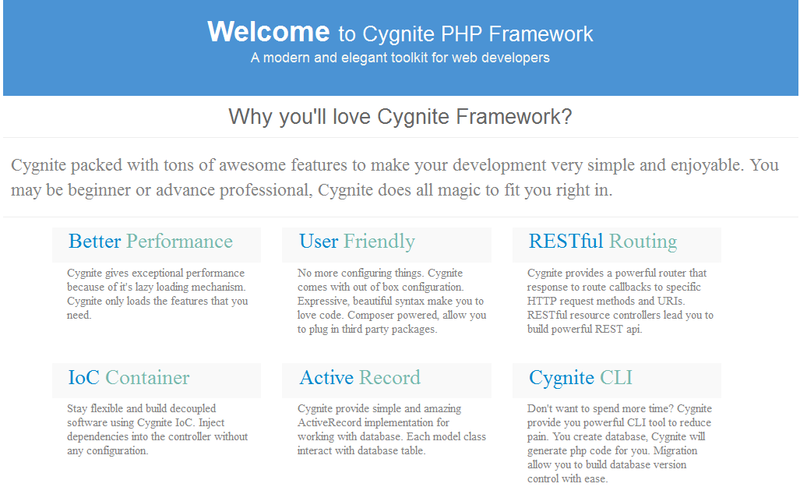 I will make use of Cygnite PHP Framework, as it is easy, powerful and does awesome job handling your backend. Very first thing we need to do is install Cygnite. I will not explain installation briefly, as it is described well in Cygnite'sbeautiful documentation. After downloading cygnite package from github repo, unzip and rename the folder to "cygnite". Now open your browser and navigate to http://localhost/cygnite/. You will see Cygnite’s welcome page as below. After downloading the skeleton package from GITHUB, we need to install Cygnite core packages in order to make the application work. Please ensure you have composer installed already into your machine, and issue below command from your project root directory to install framework into your system. Before getting started with migrations you need to configure database connections into /apps/configs/database.php file. If you open the file you can see sample database connection provided. You may change accordingly. You can see we are making use of “cygnite” database, you may create same database, follow the steps or use different database and make changes accordingly. Once you configure database connection, you are ready for running migrations. If you open /apps/database/migrations/ folder you can see some files with number prefixed (xxxx_product.php etc.). These are the migration files we will run. Open your terminal, if you are using windows obviously command prompt and execute below command from your installation directory to create schema file and run migrations. Before running migration please make sure you are running migrations.sql query into your database which is available into apps/database/migrations.sql. Before running above command make sure you are changing the database connection name into the migration file (apps/database/migrations/xxxx_user.php). Then run the command you will see new table “user” created into your database with sample data. To check you may manually open phpmyadmin and find table over there. This is the table by which we will authenticate users. We will display some basic layout page where angular templates will render. Want to display multiple theme based on the page ? Cygnite layout just made it simple. You can see if you just enter the base url it will display different page and different page when uri match with routing uri "angular". Simply define layout in your controller and it will make use of the theme you wish. You can controllers using routing and also directly via uri. In the apps/ directory you will also find "routes.php" file where we can define routing for our application. Open the file and add below routing to the file in order to display our login page by default. It will display the basic page from where you will find login link, click on that and login page will appear. You can login into the application using your credentials. You can make use of Migrations files to seed some sample users to authenticate. You will find AuthController available into your apps/controllers/ directory. This controller used to authenticate users. You can find checkAction and logoutAction. You don't need write authentication code as AuthController shipped with Cygnite skeleton project. Auth Controller looks like below. * Display specific information into the form to edit. Cygnite model classes are interacting with database. You can find the model user available in apps/models/User.php so you may not need to create it. You can also create a new model manually into apps/models/User.php and change database name. Feeling lazy? Yes. No worry! Cygnite makes your job simple, you can simply issue below command to generate model for you. Above command “cygnite” represent your database name and “user” your model name. You can simply open /apps/views/user/index.view.php file, which is the landing page of our application. This single view page render all angular templates into it. In this page you will also find ng-app="MyTutorialApp" in the tag, “ng-init” and “ng-view” directives of angular js framework. You may get more informations about those in angular documentation. In your view page you must have below tag with angular module name, baseurl, and ng-view. Apart from that you also required to include angular.min.js script, app.js, and bootstrap css etc. You can find the view in apps/views/home/index.view.php file. Our all angular templates will render into “ng-view” directive. If you open assets/ folder you will find another folder called templates/ where all your templates located. Each template called via angular routing. I will not display template html code here as you can find easily there. If you open /assets/js/angular/ you will find app.js which is has all necessary code for angular to work with Cygnite to authenticate users. For this tutorial we are making use of Angular routing, Factory Service, Controllers etc. So end of this tutorial you will be able to understand how Angular routing, Authentication Service, Controllers works. Below code to define and getting the app object. We are also using ngRoute as dependency below. and in the next line we are configuring routes to repond to our url. And next AuthenticationService factory to authenticate user against database. This factory helps us to authenticate and login user, checking if user logged in, logout and get username from session. Apart from that we have LoginController, LogoutController, HomeController to perform needed openration. Below entire code for our angular authentication app. If you have a look at the code you can see all templates getting included only if there is a matching uri, angular routing made it just simple. AuthenticationService use to validate user against database using Ajax request, and display error if user credential doesn't match with database or if success redirect user to home page. That’s all we are done with the “Angular + Cygnite PHP + Bootstrap“ tutorial part1. You can see the entire application works without refreshing the page. That is how most of the modern application works. In the part 2 tutorial I will show you “How to Manage Products (CRUD) using Angular JS + Cygnite PHP Framework + Bootstrap”. Hope you enjoyed the article and helpful to you to understand how Angular and Cygnite PHP Framework does awesome job together to build interactive applications. You may feel free to add more features to your application. 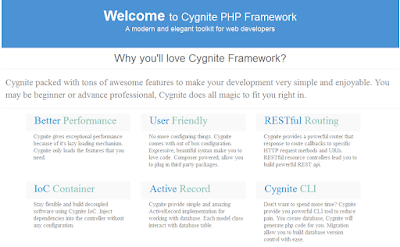 In case if you don’t find more information about Cygnite PHP Framework or Angular JS you are looking for, take a look at Cygnite Framework and Angular JS documentation . Got some idea? Send some love back. Please feel free to like, share or tweet. You will find more in coming days. Keep visiting.